PLEASE TAKE ONE BUNCH OF FLOWERS! This is the final delivery of our Winter/Spring shares. Thank you for participating with us! If you haven’t joined our Summer CSA yet, there’s still time to sign up: http://boistfortvalleyfarm.csaware.com/2015-summer-share-C6308. We anticipate starting in late June. While it’s always a little sad to finish out a delivery season, it’s also a bit of a relief. May is the most challenging Spring month for us on the farm, as we are simultaneously organizing the harvest and delivery of produce, as well as coordinating field preparation, fertilizing, seeding, and transplant of all the greenhouse starts (and repairing the tractors and equipment…). So after this week’s delivery, we are able to focus our attention more directly on getting all the seeds and seedlings into the field for Summer. In today’s delivery, we have several items from our farm, including leeks, oregano, potatoes, dry beans, and flowers! We have also included more Northwest grown organic asparagus, greens, baby bok choy, and apples. But I forgot one thing. The strawberries…Oh, the strawberries! This is the earliest that we have ever harvested strawberries. In a good season, we get approximately four weeks of harvest, but I’m not sure what to expect this season, as it’s so early and the weather is so varied. Regardless of the duration of their presence, we are glad to have them for you this week! Please, oh please, eat your strawberries right away. They will not last in your fridge, or on your countertop. We have harvested them especially for you, so that they will be lovely as long as possible, but that still isn’t very long. The variety that we grow is a classic, with amazing flavor, but as one local writer put it, you can’t ship them across the street. These odd little bursts of rain that we have enjoyed of late make them particularly soft and juicy. Please take 1 bunch of Peonies! 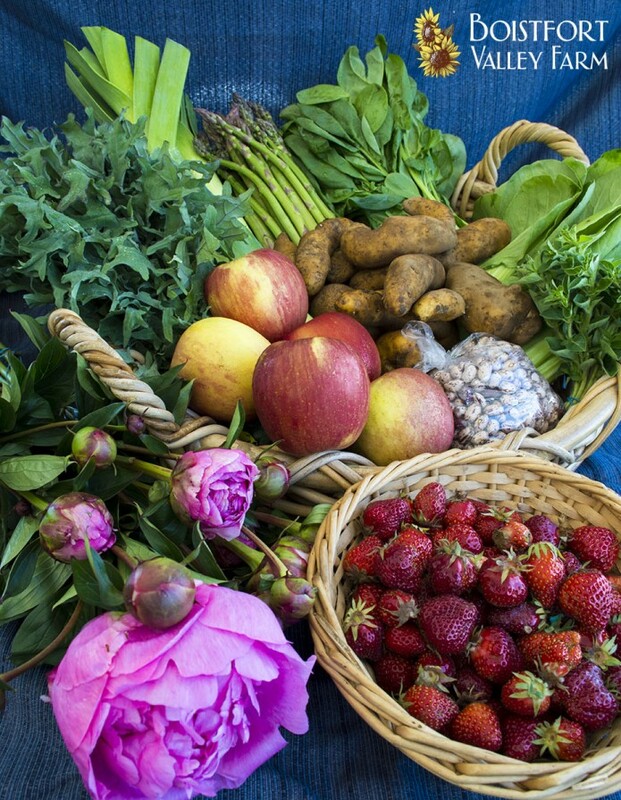 This week brings us to our last box in the Winter CSA subscription. We are ending on a green note with lush Curly kale, Italian kale and Red leaf lettuce. Thank you for joining us through this past winter!! If you haven’t yet signed up for your summer subscription, please remember to do so! We anticipate our first summer box coming the 3rd or 4th week of June. Be watching for our Season Opener email in the next couple of weeks, confirming the dates and drop points of this summer’s boxes. We look forward to accompanying you through the summer season. On the farm, we continue to transplant–eggplants today, and peppers, tomatoes, cilantro, beets and onions later this week. Last week we planted rows of strawberries, next to the lush plants already there, full of blossoms and plump green berries. Our strawberries should be available in mid-June, the specific dates dependent on the sunshine; we will keep you posted. In this week’s box you will find thyme, mint, and crisp French breakfast radishes, as well as the aforementioned lettuce—bright heralds of spring harvest. This week, we have also included Almond granola from Eat Local. This hand-roasted granola features currents, almonds, and pumpkin seeds. Make sure to sign up for our summer season. Enjoy your veggies and see you next month! Here we are, already into May, our second-to-last box of the winter subscription coming to you this week. At the farm, we are moving headlong through spring. Under last week’s sunny skies our second large transplanting of the season took place. Lettuce, celery, and the brassica starts (broccoli, kohlrabi, and kraut cabbage) all went into the quickly warming ground. You will also find a bag of dry Teggia beans, which we are very excited to offer. Teggia beans are a bush bean of the French shelling variety. We produced a crop of them last summer, harvested them with their plants, and set them in the greenhouse to dry. These beans have a delicate, creamy flavor. They pair well with this week’s oregano, cooked until tender and finished with a drizzle of olive oil. As we are nearing the end of our winter season’s subscription, I’d like to remind you to sign up for your summer boxes. They are delivered weekly and will begin mid- to late June. Thanks so much! Today is Earth Day. We are enjoying a combination of both sun and rain here in the valley, typical of our Pacific Northwest spring. This is a season of change; we are reminded of this as the sharp breezes and cold showers are warmed by bright sun breaks. It is in this transition of winter-to-spring that seedlings thrive, reveling in the steaminess of the newly-turned ground and satisfying our long-standing anticipation of the days to come. At this time of year in the kitchen, we are in transition as well. We are just beginning to enjoy the fruits of new-things-growing, while still holding ourselves over with our winter fare. In this week’s box, the sturdy, cold-hardy standbys of leeks, kale, carrots and potatoes are spiced up by glimpses of the freshness of spring—dandelion greens, rhubarb and oyster mushrooms. This week especially, greens are exploding in our area, and in our boxes, adding a lushness to the mix. In MY kitchen, I have been adding shredded kale to everything — from salads, to curries, to pizza. As this is quickly becoming redundant, I am looking forward to trying Rachel’s recipes this week. In this week’s notes, I would also like to introduce myself. My name is Emily and I have recently joined the Boistfort Valley Farm team as our Sales and Outreach representative. I grew up in the valley, next door to the land which is now the farm. I find it a bit nostalgic to think that the fields I ran and played in as a kid now hold the vegetables that nourish my family as well as yours. One of the best things about our temperate climate, in my book, is how easy it is to use the outside grill all year long. (Even when I haled from colder climes I used the grill in snowy weather but it did inspire a little head shaking from the neighbors.) This is one of the most satisfying times to use the grill because it is often warm enough to stand outside and take in the changes to your yard and garden while being cool enough to inspire the need for a hearty warm meal. What a coincidence that the end of winter vegetables grill and roast so beautifully! The aroma of roasting shallots and onions may be one of the best appetizers on earth – or perhaps mixed into a skillet of collard greens to flesh out that verdant smell. Of course, a pot of beans would go well with those greens…maybe a little cornbread? Well, before I wander off behind my taste buds, remember, just as when you roast in the oven, the leftovers may have the best flavor, so don’t hesitate to make plenty so you have some for soups and stews and to dress up that cold weekend sandwich. We have a little time left before all those showy above ground vegetables take center stage so fire up the grill (or the oven) and enjoy some ‘fruit of the earth’ for supper. Please take 1 cheese & 1 bunch daffodils. I’d like to introduce myself as the newest member of the BVF team. My name is Kathryn and I am the new Production Manager here. Over the years, I have bounced back and forth between Vermont, Montana, and the Northwest. My background is in organic vegetable and seed farming and I spent the past few years working in my home state of Vermont for an organic seed company. I’m happy to have returned to the Northwest and am busy integrating into this great place. Rachel, Mike, and Bj have all been getting me up to speed, and I look forward to making connections with you all as well! I’ve just returned to the office after a lovely few hours of seeding in the greenhouse. The clouds broke every so often that it warmed up to a nice, humid 75 degrees, I’d guess. The onions are looking tall, soft and a beautiful vibrant green while the celery, lettuces and artichokes are just beginning to show their first true leaves. Today I seeded some of our first plantings of those cool-loving brassicas: broccoli, cauliflower, kohlrabi, and cabbage. These crops all have lovely, hard, round seeds that never cease to enamor me with their subtle, varying shades of purples and reds. I love spending the time in the greenhouse to get to really examine those tiny living spheres that will turn into our shared bounty in a few short months. The same variety of cabbage that I seeded today is also featured in your box in the form of sauerkraut from OlyKraut. Cabbages that are best used for sauerkraut are very dense with thin leaves and a blanched interior and this variety can grow up to 12 lbs. We grow this cabbage exclusively for OlyKraut so we are happy to, in the depths of winter, be able to include it in your CSA box. Enjoy! Whenever anyone has a complaint about the weather here in western Washington I am quick to say that I can’t help but like it – I live here on purpose. The trick, of course, is to live here with purpose. Farmers like Mike and Heidi are full of purpose. Watching plans take shape for all that will be produced and delivered in the coming year (and beyond) is an amazing coming together of dreams and realities intricately fitted together – not unlike Mike’s annual jigsaw puzzle. The framing pieces are your plans for a delicious, healthy and purposeful life. You are the anchor piece in our plans and we are so proud to be part of yours. Even though we are still working in a little snow here in the Boistfort Valley and have lots of yummy fare still coming in our Winter Shares, the 2014 Summer Season is taking shape! As in years past, we are offering Early Bird pricing for Summer Shares paid for in full before May 1st. It is one way for us to say thank you for supporting your local organic farmer and participating in the stewardship of western Washington farmland. Please visit the website at http://www.boistfortvalleyfarm.csaware.com/store and place your order, either paying in full or using the handy installment plan. We deliver to a few less sites in winter so if the website doesn’t offer your favorite spot just remember that we will solidify our delivery calendar in June and we can update your delivery location then. Rachel has come up with some first-rate recipes for this week’s offerings so I had best leave her a little room. I find a lot of promise in a grey February day, as if some purpose is assured! Let me know how we can help with your plans for the coming season. I look forward to hearing from you. We are still busy here at the farm. We are down to a skeleton crew with only two men in the field, and Rachel is often alone in the pack shed. We do try to cross train everyone and the field crew is generous with their time in helping Rachel when she needs it. Darren Johnson has taken the hot seat as our delivery driver, and has settled in well. I have traveled with Darren in an old mini-van full of children ranging in age from 14-5, he is a calm and capable driver and we are pleased to have his help. Say hi if you get a chance. Heidi and I have been working on the seed order and planning for next season. Then there are all the other year end responsibilities; taxes, compliance issues, and the like keeping Bj and me busy in the office; never a dull moment. I so hope you are enjoying your deliveries. If so please talk us up and know that it is never too late to join for the remainder of the winter deliveries, nor too early to subscribe to our summer 2014 season. Our advertising will go out in early February. Current members will be able to join through the website by February 1. Elegantly smooth and sweet, Finca Vista Hermosa embodies the essence of Guatemalan coffee. Exquisitely balanced you’ll find juicy orange citrus, bakers chocolate and hints of passion fruit in every cup. Family owned and operated the Martinez Family firmly believes: “if you can’t do it well, don’t do it at all.” A 2007 Cup of Excellence winner, this exclusive testament to Guatemalan coffee is one worth experiencing. I have to admit, when I opened the notes to begin writing I was delighted to find that there was so little room left once the recipes were included. Some days I just have more to say than others. I do hope you all enjoyed the holidays and that your transition back to the grind or the life or just getting the kids back to school and into the routine again has gone smoothly. The house still smells mildly of frankincense and myrrh, and I am happy to report that my annual jigsaw puzzle (this year a 1500 piece Springbok) is on schedule for completion. I set out a puzzle every year on the dining room table and endeavor to complete it before starting the seed order on the same table. The puzzle comes out after the plates are cleared from Christmas dinner, and must be finished in enough time to complete the seed order by January 15th. I am going to be pushing it but I’m confident. I love the annual jigsaw; a concrete and hopeful metaphor. I start by turning all the pieces over, then attempt to identify all the edges, then construct the outline, then separate by color and texture, then begin to fit the puzzle together, one piece at a time, sometimes quickly sometimes slowly, until the image begins to take shape, eventually matching the perfect picture as it appears on the box top. More things in life should be like this. Enjoy this deliveries add-on; Black Sheep Creamery’s Tin Willow Tomme. Tomme is a type of cheese produced mainly in the French Alps, and is traditionally a bit lower in fat than other more ‘full’ cheeses. Brad at Black Sheep identifies it as a bit milder by comparison, and an excellent cheese to pair with fruit and a red wine for an appetizer. Check out Black Sheep Creamery on the web at www.blacksheepcreamery.com .